The third episode in this series of Doctor Who is perhaps the weakest of the first three. But that’s not to say it’s bad, it’s just that the first two were great and this one is just ‘quite good’. But there were some brilliant moments thrown in there too, from the great performances and direction to the very funny script. Robot of Sherwood is perhaps most like writer Mark Gatiss other episode The Crimson Horror in that it’s camp, funny and just an all round fun episode. The episode starts off with the Doctor asking Clara where she wants to go and she confesses that she’s always wanted to meet her hero – Robin Hood. While the Doctor doesn’t believe he was a real person he goes anyway to prove Clara wrong. Turns out she wasn’t and Robin Hood did exist, much to the Doctor’s annoyance. And this is where most of the episodes comedy comes from, with the Doctor and Robin both trying to out do each other. A stand out scene in the episode is a scene where, after being captured, The Doctor, Clara and Robin are trapped in the dungeon of the Sheriff’s castle and while humour is sometimes a bit hit or miss in Doctor Who, this scene is a real hit. As well as the script the direction of the episode was also solid, with some interesting lighting and cool shots which helped alleviate the cheap feeling some episodes of Doctor Who can have. all of this being especially surprising after the great job Ben Wheatley did in the previous episodes. Another good part of the episode is the performances, of regular cast members and guest stars alike. Peter Capaldi continues to cement his title as one of the greatest doctors and I am warming to Clara as the series goes on. Tom Riley is also great, portraying Robin Hood brilliantly as a dashing, joyful and slightly irritating hero who is perhaps hiding something. 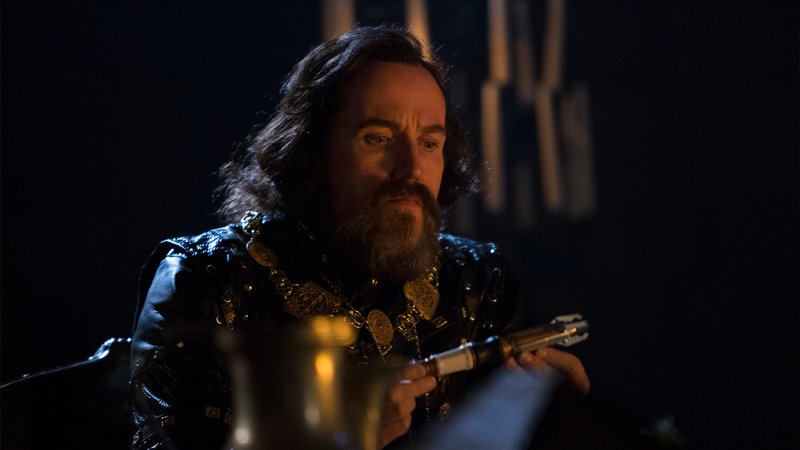 The villainous Sheriff of Nottingham, played by Ben Miller is equally enjoyable, hamming it up almost as much as Alan Rickman did in the role. A lot of people might not like the more wacky tone and it does dominate the episode, to the point that the storyline suffers slightly. The episodes climax is a little disappointing and the motive behind the Sheriff’s evil plan isn’t very well explained with the same being said of his Robot companions. Part of this could be explained through the fact that a plot point about the Sheriff being a robot, present in the original leaked script, was cut out, leaving not much of that plot line left in the finished episode. There is good reason for this cut but nevertheless the episode suffered because of it. Overall, the third episode in this series of Doctor Who was a strange one. While the plot and character motivations were weaker than the usual Doctor Who standard, the script, performances and direction pretty much made up for it. The humour and tone might not be for everyone but if you’re like me and you enjoy all the types of Doctor Who episodes, both the camp and wacky ones like this and not just dark ones that started this series off, then you should love Robots of Sherwood. And if not, then wait for next weeks episode- it looks like a good’un. No review of this episode can be valid because the pivotal and climactic scene between the Sheriff and Robin was cut before broadcast by the BBC. It explained why/how the Sheriff was “part man, part engine.” One can only hope the full episode will appear on the DVD. Yeah, in the review I linked to a news story explaining this and I agree, I hope it’s released eventually. But it did take away from the episode in my opinion regardless of the unfortunate reason it was taken out. The cut destroyed the integrity of the story. As a librarian all censorship offends me. I agree but I sort of understand why it was done; because of the recent actions of ISIS they didn’t want to offend anyone. But yet they left the Doctors extended joke about beheading in the episode. If a scene of beheading is likely to offend then surely this scene would as well? Absolutely. Plus one robot lost a head or was it just his helmet that the Sheriff picks up and tosses into the fire. Besides the Sheriff is a robot, not a human. The whole decision to cut the scene was wrong. Back to censorship question again. Will stop now but thanks for the chance to let me vent my frustration and indignation at destroying a piece of art. Sorry to say hundreds if not thousands of people sadly die every day all over the world. A few seconds of a tv show doesn’t really make that much of an impact.